To those just joining us, on our previous entries I have professed my undying love for both things Disney and music. Surprisingly, my love of both does not often cross paths. While I do like some music from Disney films, and I do love the atmospheric music at the theme parks, I don’t generally go out of my way to listen to it. There’s so much great music in the world that it barely crosses my mind. That is, until I saw a relatively new (okay, released late 2009) collection by Los Lobos. The album, entitled “Los Lobos Goes Disney,” is a bunch of covers of various Disney songs from both movies and the parks. Los Lobos have a definite connection with Disney, including providing the theme song to preschooler beloved Handy Manny. 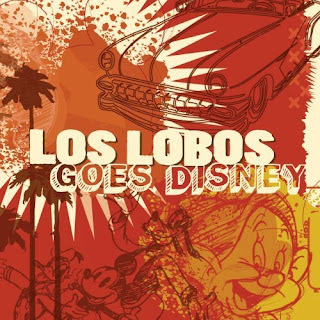 Thus, the album isn’t exactly out of left field, though I was definitely interested to see how the Lobos incorporated their Chicano rock with Disney classics. In general, they really don’t do anything that shocking. It both helps and hurts the album that it seems they went for a mix of songs that suited their sound, rather than just picking classic songs. Specifically, there are two songs from the oft forgotten animated Robin Hood, and a track from Summer Magic, which is obscure enough that I had to Google it. They represent the parks with songs from The Enchanted Tiki Room, Haunted Mansion, and the obligatory “it’s a small world” in a medley with something else. At least they do us a favor of not singing the words in that one. As I said, the only cover that really tries to be adventurous is a raucous, organ and guitar filled rendition of “Heigh-Ho,” with all Spanish lyrics (except heigh-ho, which is apparently a universal term). Unfortunately, “Heigh-Ho” itself is barely a real song, so turning it into a full on rock song just doesn’t work, with repetitive lyrics and musical breakdowns that seem completely out of place. The album does improve after the first track. From then on all the songs are in English, and they mostly stick to a more laid back sound. “I Wan’na Be Like You” turns out well with some Southern influence, and “Not in Nottingham” could be a legitimate blues track when removed from the Disney context. Out of the theme park tracks, “The Tiki, Tiki, Tiki Room” is fun but barely distinguished from the original, while “Grim Grinning Ghosts” is a major disappointment. Instead of speeding the song up, like the Bare Naked Ladies did in their wonderful cover, the Lobos slow it down and add unnecessary female vocals, turning it into a three and a half minute song that feels like it is five minutes long. Overall, the album makes for some decent easy listening that is family friendly but not cloying or annoying. The relaxed nature of most of the tracks also makes it the perfect soundtrack for a get-together of Disney lovers. I wouldn’t race out and buy it, but it’s definitely worth a purchase for those interested in a slightly different, but in no ways shocking, take on Disney classics.